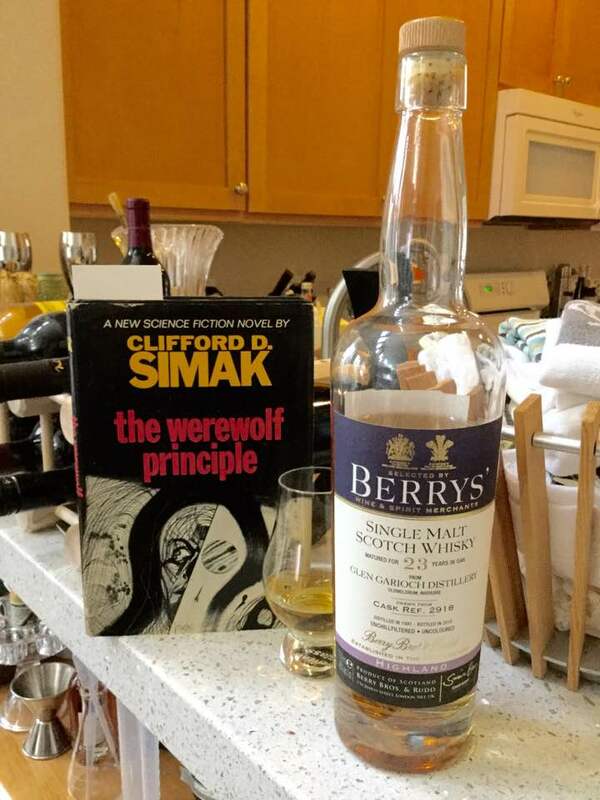 An independent bottling of Glen Garioch (pronounced glen ghee-ree because Scotch apparently) and an off-the-beaten-track Simak novel, The Werewolf Principle are what I've got paired up today. The Glen Garioch 23-year-old from Berry's is all about honey, stewed fruits, peppermint and leather. The 1967 Simak novel is all about the issues of the day - genetic modification , how much is a good thing, how to legislate it and what becomes of the GMOs themselves, all against the backdrop of a post-scarcity society...with flying houses and holographic wallpaper thrown in for good measure. Mind-blowing, especially considering when it was written! Simak is the consummate storyteller, a veritable "Willa Cather of Science Fiction" and Glen Garioch, with the benefit of a decade or so of extra aging, make a perfect pairing. I can heartily recommend them individually or together because the best thing with a good book is a good dram!